Easter in New York is not very widely celebrated, the shops are open for business as usual. Also, you should know that in the United States no Easter Monday is celebrated, unlike in Australia. Easter always falls between March 22 and April 25. In 2019 Easter Sunday will fall on the 21st of April. Easter Monday on the 22nd of April and Good Friday will be the 19th of April. What can you expect at Easter in New York? During Easter in New York your trip will not be hindered; almost all the shops are open, even on Good Friday as it is not a public holiday. 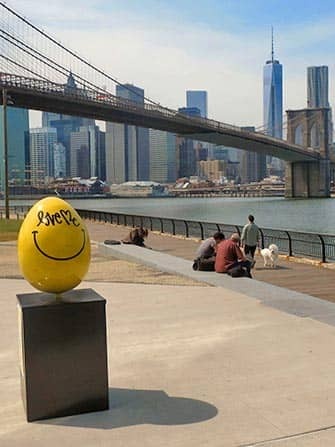 What can you do at Easter in New York? Easter “egg hunt” events are organised in various places. It is great to participate, especially if you have children. I would also definitely suggest going out for a nice Easter brunch. There is also an Easter parade, this parade lasts from 10:00 to 16:00 and happens on Fifth Avenue. This parade has no float or marching bands, but people walk in Easter themed outfits and wear Easter hats. The clothing ranges from fashionable outfits and animal costumes to civil war attire. 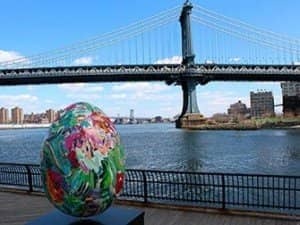 There are several events for hunting and painting Easter eggs, for example in the Brooklyn Children’s Museum and the Children’s Museum of Manhattan. At Trinity Church there is an Easter Fun Fest. You can also attend a service at one of the churches in New York, many hold Easter ceremonies. Do you fancy something special this Easter in New York? This brunch cruise is for you. You will pass by several of Manhattan’s highlights, such as the Statue of Liberty and the Brooklyn Bridge. In the meantime you can enjoy live jazz music and a lovely Easter brunch buffet with free Mimosas. When you’re finished eating, the DJ will ensure a festive end to this cruise.